I am working on a survival suspense story, where a sizeable group of surivors is trapped in a tropical island (somewhere in the Ring of Fire) by a volcanic eruption. They find shelter from the erpution in an old mansion built in a high-rise cliff on the edge of the island. The cliff is sturdy and the mansion is stonemasonry, so there is little danger of fire from cinders or a collapse. The eruption I am visualizing would have a Volcanic Explosivity Index of 4 to 5. Most of the inhabitants and tourists of the island died because of the pyroclastic flow and other eruption hazards. Only the few that climbed the hill leading to the cliff survived because the pyroclastic flow goes downhill, and there is a sizeable valley between the volcano and this hill. They are cut off from rescue for a long period of time (so I can play with isolation, food shortage and so on), so I need the mansion to survive the eruption and remain in the extreme end of habitable (temperature, etc - almost inhospitable). Sickness from inhaling ashes and heat strokes are hazards that will claim some survivors, but a handfull must survive to the end. The lava flow would reach the ocean before climbing the cliff, but isolated the group from the rest of the island, and is too close for confort, but they can still venture outside the manor for short periods of time. How close can I put the mansion from the lava flow and/or the volcano caldera so not to push the suspension of disbelief? It depends first on the eruption. Mt. St. Helen's type eruption is devastating for many miles in whichever direction it blows. 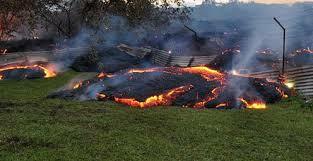 Hawaii type is mostly medium to slow lava flows making the island bigger is another matter. They could easily have some fast flows and cut off the people in the mansion. If it was a little bigger and went in other directions too, then any emergency response would be focused else where leaving the far reaches to fend for themselves for a while. EDT: Taking into account the size of the eruption, you might want to have an uneven one, like Mt. St. Helens. The main resort side is in the direct path of the eruption and most of the flow, leaving the other side (more of a remote location) to be 'safe' and anyone who was staying there or just touring the 'back' of the island would be the survivors. Looking at a variety of VEI 5 eruptions throughout history, I think 20-30km is often immediately survivable, regardless of terrain. That's not to say the house might not catch fire or collapse in the resulting earthquake. Another factor that might let you get closer is that not all eruptions are directly upwards. To take Mt. St. Helen's again, that blast was most severe towards the north, where the mountain sloughed away a 27km landslide, followed by a pyroclastic flow in that direction that covered an area 37km by 31km. The biggest problem your hapless tourists are going to face is asphyxiation from the immense ash cloud that is the very definition of a VEI 5. That, and the searing heat of the potential shockwave. You might consider going for a smaller VEI number, as that has much less to do with the amount of lava as the total amount of all ejecta combined. Not the answer you're looking for? Browse other questions tagged science-based geology survival volcanoes or ask your own question. How does the Ash Manor get electricity? What factors could delay the rescue of a small group of survivors on a Pacific volcanic eruption? What wearable material do I need to survive a pyroclastic flow? Could a large string of mountains stop volcanic ash from traveling any farther?